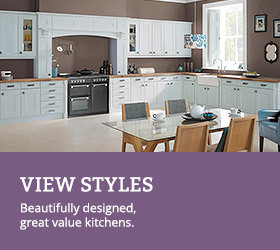 Measuring up is the perfect starting point when planning your new kitchen. Taking some time to create an accurate plan will make the rest of your project run smoothly. 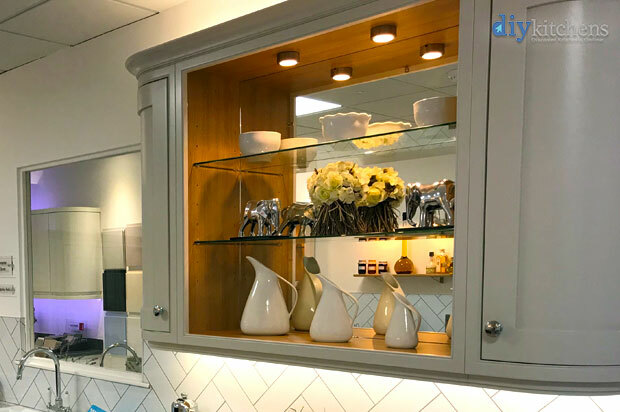 Ensure you double check your dimensions at a couple of heights around your walls, if in doubt always plan your kitchen around the smallest dimension. Check ceiling heights and how level walls and floors are. Make a note of the location of your gas, electricity and water supplies and remember to use a qualified tradesmen if you intend to move or alter these. 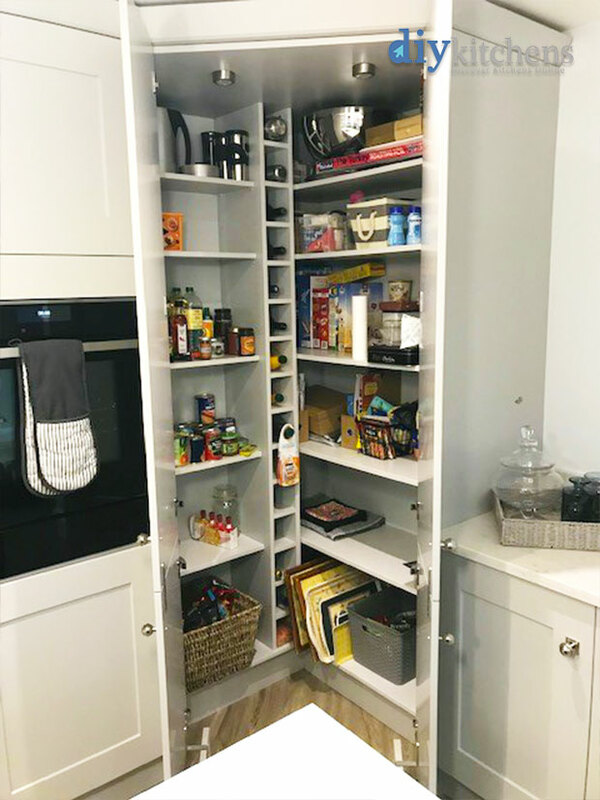 Don’t forget, if you have a problem area to plan around, all of our cabinets can be ordered dry assembled in needed, and put together on site! Our wall units appear to be 280-290mm deep and we want to add to these, you don’t seem to do these sizes, would we need to replace them all or are we not measuring them correctly? Hi, our wall units are 300mm deep (measured from the wall to the front of the unit). You want at least 300mm to ensure that you can get your dinner plates in them. Are the dimensions for the all the units taken from the external faces of the carcass or internal faces? Hi, the dimensions are all taken from external edges. So, if you ordered a 600mm wide wall unit, that is the exact amount of space required on your wall. i want to fit a recess with kitchen units and my large fridge and freezer the depth of the recess and my fridge and freezer is 570mm do you make units this size? We sell integrated fridge/freezer housings below. These will not house a freestanding fridge/freezer though. All our tall units and base units are 560mm deep with around a 20mm door giving a total depth of a round 580mm. So you maybe OK. Here is an example of a freestanding fridge/freezer being integrated with the design of the kitchen. If you want to fill a recess bigger than 580 deep and put your freestanding fridge freezer in there then you would need to bring all your tall units forward so that your fridge/freezers fits in, get an oversized worktop (if you have any base units) to cover any gap at the back and get some big end panels on the units either side of the fridge freezer and an end panel at the end of the kitchen run that can cover any gaps that may be present. 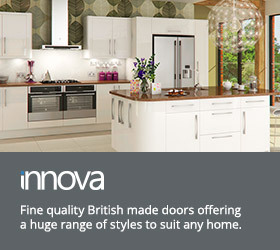 I am trying to ascertain how far from the walls the front edge of a worktop, and the front face of the doors would be. I have the following questions relating to this theme. 1) What is the recommended overhang for a solid wood worktop on a shaker style cabinet? 2) What is the recommended distance between the back of a cabinet and a wall? 3) I have some existing central heating pipework which sits proud of the wall, can this be incorporated into the built in void that features in your cabinets? 4) What is the best way to marry up a worktop with an uneven wall surface? (in this case, old brickwork). 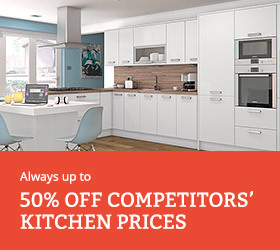 5) Do the dimensions of your cabinets include the doors? Hi, answers to your questions are below. 4, If it is wood or laminate it needs scribing to the shape of the wall. 5, No. The base units and tall units are 560 deep and the wall units are 300. You then need to add on the thickness of the doors 18mm-22mm. 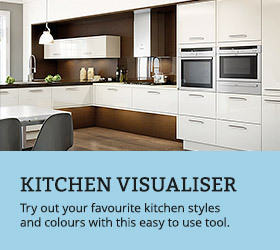 Hi, we don’t offer a design service but if you have a plan of your kitchen and units required, then you can send this to sales@diy-kitchens.com to obtain a quote. 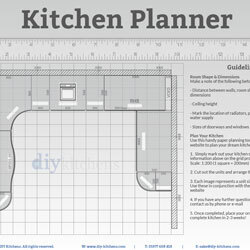 On your kitchen planner you have base unit cut outs with “voids” shown. What are these voids, please? A very good question and one that warrants a lengthy response. Rather than write it here, I created a page for you and for others to read on kitchen service voids and why they are needed.